Cold frames, sun boxes, and hot beds are relatively inexpensive, simple structures for providing a favorable environment for growing cool-weather crops in the very early spring, the fall, and even into the winter months. Some are elaborate and require a large investment, but are reasonable for those who are serious about having fresh vegetables during the winter.Cold frames and sun boxes rely on the sun for their sole source of heat. Hot beds are heated by soil-heating cables, steam-carrying pipes, or fresh, straw manure buried beneath the rooting zones of the plants. Heat is collected by all these frames when the sun’s rays penetrate the sash made of clear plastic, glass, or fiberglass. The ideal location for a coldframe is a southern or southeastern exposure with a slight slope to insure good drainage and maximum solar absorption. A sheltered spot with a wall or hedge to the north will provide protection against winter winds. Sinking the frame into the ground somewhat will also provide protection, with the earth for insulation. To simplify use of the frame, consider a walkway to the front, adequate space behind the frame to remove the sash, and perhaps weights to make raising and lowering of glass sashes easier. 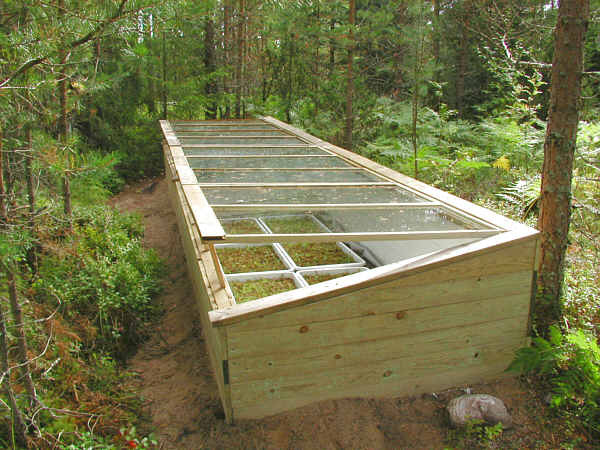 Some gardeners make their cold frames lightweight enough to be moved from one section of the garden to another. Another possibility is the Dutch light, which is a large, but portable greenhouse-like structure that is moved around the garden. New designs in cold frames include passive, solar-energy storage. For example, barrels painted black and filled with water to absorb heat during the day and release it at night. The solar pod is one design that provides this type of heat storage. 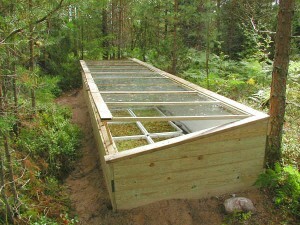 Other new cold frames are built with a very high back and a steep glass slope; they are insulated very well. These structures also include movable insulation that is folded up during the day and down at night or during extremely cold weather. In early spring a cold frame is useful for hardening off seedlings that were started indoors or in a greenhouse. This hardening-off period is important, because seedlings can suffer serious setbacks if they are moved directly from the warmth and protection of the house to the garden. The cold frame provides a transition period for gradual adjustment to the outdoor weather. It is also possible to start cool-weather crops in the cold frame and either transplant them to the garden or grow them to maturity in the frame. Spring and summer uses of the cold frame center around plant propagation. Young seedlings of hardy and half-hardy annuals can be started in a frame many weeks before they can be started in the open. The soil in a portion of the bed can be replaced with sand or peat moss or other medium suitable for rooting cuttings. Fall is also a good time for sowing some cool-weather crops in cold frames. If provided with adequate moisture and fertilization, most cool-season crops will continue to grow through early winter in the protected environment of the cold frame. Depending on the harshness of the winter and whether or not additional heating is used, a cold frame may continue to provide fresh greens, herbs, and root crops throughout the cold winter months. Growing frames can be built from a variety of materials; wood and cinder block are the most common. If wood is preferred, choose a species that will resist decay, such as a good grade of cedar, or use pressure-treated wood. Never use creosote-treated wood or wood treated with pentachlorophenol, because these substances are harmful to growing plants. Wood frames are not difficult to build. Kits may also be purchased and easily assembled; some kits even contain automatic ventilation equipment. There is no standard-sized cold frame. The dimensions of the frame will depend on the amount of available space, desired crops, size of available window sash, and permanency of the structure. Do not make the structure too wide for weeding and harvesting: 4 to 5 feet is about as wide as is convenient to reach across. The sash of the frame should be sloped to the south to allow maximum exposure to the sun’s rays. Insulation may be necessary when a sudden cold snap is expected. A simple method is to throw burlap sacks filled with leaves over the sash on the frame at night to protect against freezing. Bales of straw or hay may be stacked against the frame. Ventilation is most critical in the late winter, early spring, and early fall on clear, sunny days when the temperatures rise above 45F. The sash should be raised partially to prevent the buildup of extreme temperatures inside the frame. Lower or replace the sash each day early enough to conserve some heat for the evening. In summer, extreme heat and intensive sunlight can damage plants. This can be avoided by shading with lath sashes or old bamboo window blinds. Watering should be done early in the day so that plants dry before dark to help reduce disease problems. Article written by Patsy McNatt, Extension Master Gardener Volunteer.